Outdoor TV Cover, Weatherproof Universal Protector for LCD, LED, Plasma Television Sets, Built In Remote Control Pocket, Compatible with Standard Mounts and Stands. ★Waterproof remote controller storage pocket. ★3 way flaps on rear fit most mounts and stands. ★Soft liner prevents your TV screen from scraping when not used. ★Provide 360 degrees protection and extend the life of your outdoor TV. Size 30"-32" Length 23" Height 33" Width 5"
Size 36"-38" Length 24" Height 37" Width 5"
Size 40"-42" Length 26.5" Height 42" Width 5"
Size 46"-48" Length 29" Height 46.5" Width 5"
Size 50"-52" Length 33" Height 52" Width 5"
Size 55"-58" Length 35" Height 54" Width 5"
MONEY BACK GUARANTEE We think you're going to love our outdoor TV cover as much as we do. But in case you don't, just return it within 30 days for a full refund, no questions asked. LIMITED TIME PRICING: Buy now to take advantage of the limited-time special pricing. 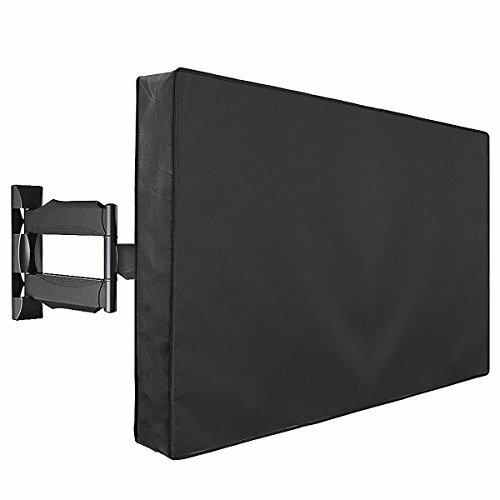 【PREMIUM QUALITY MATERIAL】- This outdoor TV cover protects your TV from the harsh elements, whether it be wind, rain, snow, dust, UV, or mold and mildew. Provide a full range of protection and extend the life of your outdoor TV. 【360 DEGREES PROTECTION】- Double stitched edges to ensure maximum strength,provides the best protection for your outdoor television. Soft liner prevents TV screen from scraping. The BOTTOM VELCRO can provide the maximum coverage against water. 【EFFORTLESS INSTALLATION】- 3 way flaps on rear easily compatible almost every wall mount . The waterproof REMOTE CONTROL POCKET facilitate storage of your remote control. 【SIZE TO FIT】- This outdoor TV cover compatible with LED, LCD and Plasma TVs 30 to 58 inches. Don't forget to measure your TV. Choose a suitable size cover for your TV according to the product description. 【100% SATISFACTION GUARANTEE】- We think you're going to love our universal weatherproof protector as much as we do. But in case you don't, just return it within 30 days for a full refund, no question asked. If you have any questions about this product by Ihomepark, contact us by completing and submitting the form below. If you are looking for a specif part number, please include it with your message.